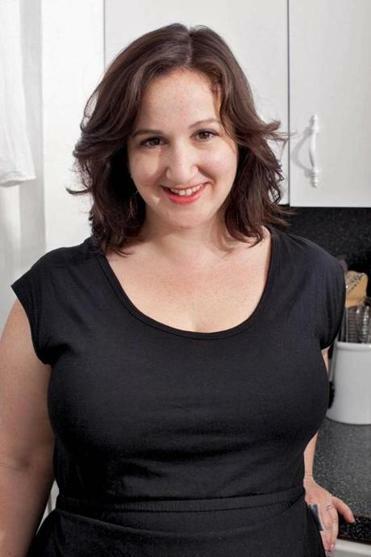 Deb Perelman was in the first wave of food bloggers. In 2008, when Deb Perelman first launched Smitten Kitchen, hers was among the first wave of blogs to harness the gathering power of the Internet. With her tiny urban kitchen, scrappy recipes, and close-focus pictures, she established an intimate presence that had broad appeal without being overly folksy. It took six years for book to follow blog, but her fans are likely to find “The Smitten Kitchen Cookbook” worth the wait. Here’s how Perelman describes her approach: “A lot of comfort foods stepped up a bit.” These reinventions may not be the last word in novelty, but Perelman has a way of embracing interesting shortcuts and substitutions. I can’t get over how meaty a portobello mushroom tastes (what’s in the dirt they grow in anyway? ), a quality Perelman exploits to great effect in a remake of boeuf Bourguignon. Mushroom Bourguignon has much of the lingering, savory depth of its meat counterpart, which makes you feel vaguely guilty that it took only a fraction of the time. Why not skip the time-consuming ridges in gnocchi? Perelman asks. Well, you could argue that the ridges hold the sauce better. But the recipe’s savory tomato broth commingles happily with the bald gnocchi, and according to the author, you don’t even need a ricer — a box grater will do. 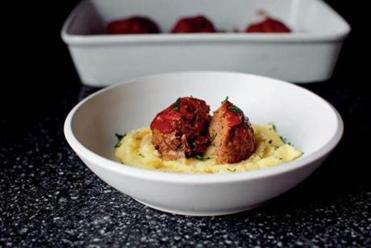 In “The Smitten Kitchen Cookbook,” author Deb Perelman includes a recipe for browned butter mashed potatoes following this one for meatballs, to serve with them. A roast chicken with grapes, olives, and rosemary ends up with a fruity, salty, piney fragrant sauce, which Perelman rightly predicts you’ll slurp with a spoon. In my case, the sauce did not extend all that far into the chicken itself, but the dish was worthwhile because of the sauce. Slightly fussier is a casserole of stuffed shells in lemon ricotta bechamel. My shells wanted to break, and they didn’t close up around the artichoke filling as in the photograph. Still, I counted it a hit for its nutty artichoke flavor and creamy, but not overwhelming, blend of cheeses. A lamb chop recipe introduced me to using chaat masala, the Indian spice blend, as a dry rub. It’s addictive, especially with chopped pistachios as a crust for the lamb. You can spend some happy long moments getting the perfect balance of lamb and cucumber raita on your fork. A sugar snap and Napa salad comes out crisp and crunchy, with the same rich, cold sesame dressing taste that’s so hard to resist on noodles. I made it twice so I could use some shortcuts of my own, like not blanching the peas and using my favorite commercial ginger-garlic paste instead of chopping aromatics. Gingerbread Dutch baby turns out pancake-y (though not as puffy as my standby version), and warm spices make it seem like a holiday treat. Buttered popcorn cookies are too strange not to try, and folding popcorn into cookie batter will leave you full of self-doubt (but the instructions are mercifully clear). The popcorn ends up being more chewy than crunchy, and I couldn’t quite decide if I liked it. I had to find out, so I ate every one. Whole lemon bars use a classic Perelman shortcut: throwing a sliced lemon in a food processor with eggs and sugar instead of making a curd. Like all lemon bars, these get better every day, and are ironically, swooningly irresistible just at the point when there are hardly any left. I suffered just one major disaster, which happened partly because I tried some shortcuts of my own. I tried to poach mostly-still-frozen chicken breasts, with awful results. I tried to make the aioli with a stick blender, which should have worked but didn’t (I probably added the oil too fast, which I do about half the time). And for some reason Perelman’s egg instructions (boil for 9 minutes) left me with soft-boiled eggs, which were never called for later in the recipe anyway. I threw up my hands, shouting, “I can’t even boil an egg!” Humiliating. Still, I concluded, there’s no point in despairing. I could already envision throwing together my next chicken salad, with leftover chicken, doctored mayo, apples, whatever else I have around. Why not? It won’t follow the letter of Smitten Kitchen, but it’ll certainly follow its spirit. On Nov. 27 at 7 p.m., Deb Perelman will be cooking and signing books at the Miele Kitchen Gallery, 555 Washington St., Wellesley. On Nov. 28 at 6 p.m., she will give a talk at the Coolidge Corner Theatre, 290 Harvard St., Brookline, and sign books after (about 7:30 p.m.) at Brookline Booksmith, 279 Harvard St., Brookline, 617-566-6660.